It starts with a ticket number, CNIC, your name and the category you applied for. Test Date is Sunday, 13 August, 2017, and the exam will start at 8 AM in the morning. 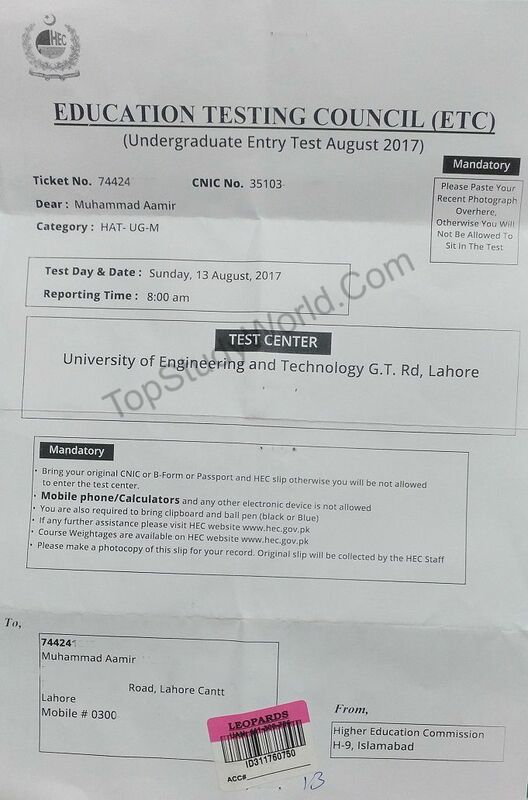 So, I live in Lahore, so test center that I came for me is UET, Lahore. Note: I have removed the sensitive information of mine in the below picture. 1. Bring your original CNIC or B-Form or Passport and HEC Slip otherwise you will not allowed to enter the test center. 2. Mobile phone/Calculators and any other electronic is not allowed. 4. 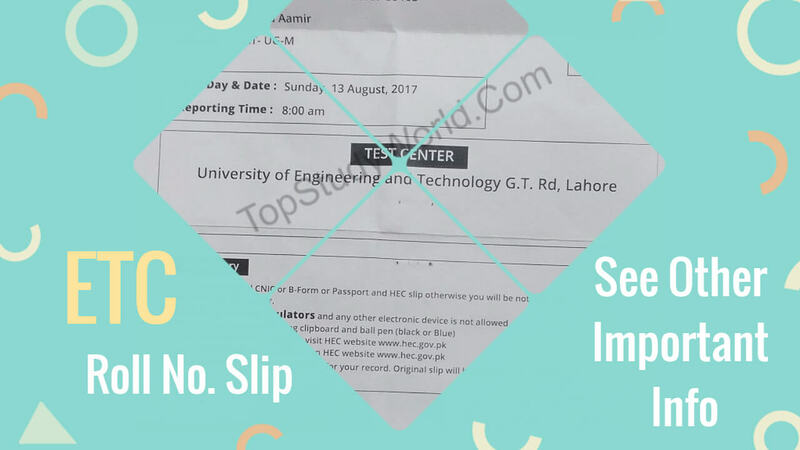 Make a photocopy of this slip, original slip will be collected by the HEC staff. 6. You have to add a picture of you otherwise the test will not be accepted. Q. What is the purpose of this test? Q. Who is eligible for this Entry Test? entering data of intermediate in Profile. Q. Whether a student can select more than one Test Centers? Q. Whether a student may appear in more than one categories of this Entry Test? Ans. No, a student is allowed to appear in only one category of Entry test. Q. Whether a student can apply direct to university for this Entry Test? Q. Is there any fee for this Entry Test? Q. How a student may contact with HEC if facing any issue while applying? in the upcoming tests under ETC. Q. For how many years, passed test will be valid? Ans. The Test will be valid for two years. Q. How to prepare for Entry Test for Fall 2017? special book for the preparation of entry test. Q. Test will be computer based or paper based? Ans. Entry Test for Fall 2017 Test will be paper based test. Q. How many times test will be held in a year? Ans. Test will be held more than one time in a year. Are you looking for the date when the HEC will send you the roll number slip, then here we go.